Nigerian News | Our Betting, Gambling & Online Casino news in Nigeria! Manchester United would have to put in an effort of herculean proportion if they hope to progress into the semi-finals of the UEFA Champions League this season. Having lost the first leg by a single goal at home, they would have to produce a performance of true grits and guts to overcome the deficit at the Nou Camp. They would be heartened by similar stirring performances achieved in Turin against Juventus and in Paris against PSG that got them to advance to this stage of the tournament. The principal gladiators of their Paris heroics, Lukaku and Rashford would have to be firing on all cylinders to offset the loss to suspension of influential defender, Luke Shaw. Barcelona on the other hand would have the cushion of their victory away from home and the support of their vociferous fans to bank on as they hope to advance to the semi-finals for the first time in four years. Led by the talismanic Messi who has already racked up eight goals and three assists in seven Champions League games so far this season, they would be hoping to prevent the sort of improbable comeback that they and today’s opponent have mounted against PSG in the Champions League. Messi would have the competent supporting cast of Suarez, Coutinho, Rakitic and Busquet to aid him in the quest of surmounting the hurdle posed by Manchester United in today’s epic Champions League clash. Read about the Juventus vs Ajax game below. Great deposit bonus on sign up! Juventus, boasting arguably the greatest player that has ever competed in the Champions League in Cristiano Ronaldo would go head to head against another traditional European powerhouse, Ajax, in their quest to add to the solitary European title in their kitty. Ronaldo, having almost single-handedly led Real Madrid to three consecutive Champions League triumphs would be looking for an encore with Juventus to cement his status as the most potent weapon deployed by teams in the Champions League. He has already produced the sort of virtuoso performance that brought glory for Real with his devastation of Atletico Madrid in the previous round, dragging Juve back from the precipice of elimination. His first leg goal in a draw against a plucky, young Ajax side ensure that Juventus go into this one as favourites to progress to the next round. However, they have to be on guard against a dangerous Ajax side that have already proved their mettle in this year’s competition by eliminating Real Madrid with a virtuoso display that downed the reigning champions right on their own home patch. Similar gritty showings against the likes of Bayern Munich and Benfica, European giants in their own rights should keep Juventus on guard all through the encounter against this promising Ajax side. Led by the exciting talent of Dusan Tadic who has already plundered six goals and three assists in the Champions League, and with the able supporting cast of Frenkie De Jong, Mathias De Ligt, and Hakim Ziyech, Ajax would not roll over easily in this tie. Paul Onuachu is born on the 28th of May in 1994. He plays for the Danish club FC Midtjylland and is a striker. He came to this club already in 2012 on a scholarship and tried a few different clubs before ending up in FC Midtjylland where he has been a consistent scorer. In March this year, he was for the first time in his life call-up to be a part of the Nigerian National Team. After this new record score, many eyes are on this extraordinary striker. Some rumours say that a team in Belgium is very interested in him. He could at this point be worth already 8-10 millions of euros which is about ₦3200-4000 millions or Naira. After the kick-off, there was one pass back before a long pass from John Ogu reached Paul Onuachu. With combined skill and luck he made his opponent and was able to score from just the outside of the penalty area. The commentator had not even introduced his co-commentator and some of the visitors had not yet arrived. It was truly an extraordinary goal and records are always fun. But as they say, records are made to be beaten. So how long do we have to wait until Nigeria beats this amazing 10-second record? Many of the teammates, managers, fans and journalist for very exciting about this new player that shows himself to be very promising. It was not just the goal that makes people talk about him. He was good throughout the game and according to his teammates also at practice. The fastest goal ever is in 8,1 second and is made from Christian Benteke when scoring against Gibraltar back in 2016. The second fast score is 0,2-second slower (8,3 seconds) and took place in 1993. So it can take a very long time until this record taken by someone else. Not a long time ago there was the international women day. We think that women in sports Nigeria should get more celebrated. Of course, it has to be put into the circumstances that so far male athletes are bringing more spectators and more sponsor money. But could it be that we are slowly seeing a change? Check out this article to find how who is our most successful female athletes in Nigeria. You will also find useful information on what it takes for women to be more acknowledges in sports in Nigeria. The first medals were won as late at 1992 at the Olympics in Barcelona. It was at 100 m x 4 so it actually brought in 4 medals. It was celebrated as it was a gold medal. Four years later it was time again Chioma Ajunwa won a gold medal as the first black African women in an individual OS field event. It was in the long jump and it was 7.12m. Nigeria also won a silver medal in 400 m x 4 as well as Bronze in 200 m. In this Olympics in Atlanta, all the medals for Nigeria were accomplished by Nigerian women. Another four years later in the 2000 Olympics in Sydney the popular Glory Alozie came in second place in hurdles and won a silver medal. The OS in 2004 was not a successful year for the Nigerian women athletes but in 2008 in Beijing again the women accomplished to get a silver medal in 100 m x 4 as well as a silver medal in long jump. What can we do to increase the awareness for female athletes in Nigeria and women in sports in general? One thing that is the first step is for the athletes themselves to make the sport more fun to watch. Make interviews, talk, open up yourself to the people. Become popular so in that way you are able to have many people that cheer for you and to get sponsors. To become a role model for other athletes there should be plenty of opportunities for athletes to get sponsorships. Especially now when there are many online casinos in Nigeria there are even more possibilities. But it could also be a good idea to talk to the national sports committee. They have some money that they can sponsor athletes with. The Nigeria Olympic Committee can be found at nigerianoc.org. Hope you learned something from this article and do not forget to appreciate your women in sports Nigeria. They are doing a fantastic job representing our country and putting it on the map for other nations to learn about Nigeria. Are you tired on a Monday? This offer will for sure cheer you up! 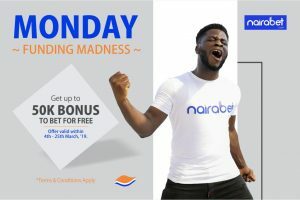 Every Monday in March you will get amazing casino bonuses at Nairabet. Enjoy a 10% bonus on your FIRST deposit that you make every Monday in March between 9-21. The bonus is a free bet bonus that you can read more about below. As Monday is normally not that fun Nairabet are doing there part to make the day much more entertaining by adding a free bet bonus. On the first deposit that you make on Mondays betweens 9-21 you are getting 10% in free bet bonus. The maximum amount that you can get in this free bet bonus every Monday in March in ₦50,000. The bonus is deducted from your the balance in your promotional account. If it does not meet the requirements it will instead be deducted from your account balance on your main account. The winning from your free bets will be credited to your main balance account minus the value of the free bets state. So for example, if you deposit ₦10,000 and get a ₦1,000 free bet with a odds of 2 and win you will be given ₦1,000 to your main balance account. What is extra good is that this offer is available for both new and older customers. Normally the generous bonuses are mostly for new players in the form of a welcome bonus. But in this case, also existing customers are getting a great start of the week. One thing to have in mind that if you make a deposit from a betting shop or using a C2C transfer you are not eligible to receive a bonus for this. So make sure to use one of the allowed payment methods. If you haven’t tried the new Paga casino payment method could be fun to try out. This promotion is running from the 1st of March to the 31st of March 2019. Are you like us a fan of Paga and would like to use it to deposit and withdrawal money from your casino account? Finally, the solution is here. If you have a Paga account you can use it already now to deposit money to for example Nairabet. Already 12 million people in Nigeria use Paga today to make easy and quick payments. Learn more about this fantastic payment method below. Paga is a mobile payment app that was founded already back in 2009 by the Nigerian entrepreneur Tayo Oviosu. The vision was to reduce the need for cash and transform it into digital payments. Paga went live in 2012 on the Nigerian market after getting a license from the Nigerian Central Bank. The use cases are many but you can transfer money for free, you can make deposits to your bank account, pay bills and much more. Now you are also able to use it to make deposits on some of the Nigerian online casinos. Continue reading to learn how to use Paga to make a deposit at a casino like Nairabet. You can either use your computer or the mobile app. Most people use the mobile app so that is the process that we are going to describe. First of all, you will need to download the Paga mobile app from Google Play or the App Store from Apple. Then you can connect your Credit Cards and Bank Accounts. Now you can use it to instantly send money to your friends and family, pay bills and much more. You can also make payments to Nairabet and other casinos to make deposits to your casino account. This is one of the fastest and most secure ways to make a transaction with a casino today. Over 12 million people are using Paga in Nigeria today and the numbers are growing quickly. This is one of the new upcoming financial services that you will not be able to be without in just a few years. Embrace the technology today and try it out to make a deposit with Paga. There are a few obstacles in the gambling market in Nigeria. In order to make the business grow even further there are a few things that need improvements. For the casino industry to grow further faster internet connections, mobile penetrations and easy to use payment methods are all important factors. Another obstacle that not many people are talking about is the tax structure. In this article, we will talk about some of the considerations that we have in this regards. The tax rate in Nigeria depends on the state. Unfortunately, there are not all states that have a specialised team or board that manage these concerns. In Lagos, for example, the system works pretty well. Whereas, in other states, the tax system is part of the regular system. This makes it difficult for international operators to enter the market. When the tax and process differ between states it makes it difficult to operate on such a market. Also, the cooperation between the states is more or less non-existing. It will become increasingly important to figure this out to make it easier for the casino industry to continue growing. With the right law and tax in place, this could be very beneficial for the states. Read more about the tax on gambling in Nigeria at naija247news.com. Another important factor is that with cooperation between different states it is easier to handle problem gamblers. To have responsible gambling is not that easy and Nigeria has a lot to learn from already regulated markets. For example, in the UK, Sweden and Denmark there are systems in place to ban yourself from all casino operators. They also have special tests, limits on how much you can gamble for each day, week and month. All of the mechanism is important and it better handled on nationwide level instead of by the state. There are a lot to learn and a lot to take into consideration. For the best for Nigeria the Nigerian gambling industry we think the government should handle tax- and other gambling matters on a federal level. Many online casinos in Nigeria are finding new ways to reach a potential customer base. One of the most innovative and largest gambling companies in Nigeria, Bet9ja recently announced that they will sponsor this year of Big Brother. After seeing the lines to the audition and the Bet9ja flags it is obvious that the sponsorship is a good idea. The auditions took place at 8 location Lagos, Port Harcourt, Calabar, Warri, Ibadan, Benin and Enugu. This very popular program will most likely attract a large number of new customers. In this article, we will try to dig a bit deeper into how this sponsorship looks like. Big Brother is a reality show first aired in the Netherlands and then spread across the world. Up until today’s date, there have been more than 400 seasons combined in more than 50 countries. The Big Brother season last year was named Double Wahala. The concept is pretty simple. People live under the same roof in a specially constructed house or apartment that does not have any contact with the outside world. The people that live in the house should try to stay there as long as possible. The last person will be the winner. To stay you can win different competitions and challenges and avoid to be voted out from your housemates. Everything is closely monitored by cameras around the clock throughout the entire show. According to trustworthy resources, this sponsorship is worth as much as ₦1.08bn. This is much larger than the previous sponsorship from Bet9ja of the Nigerian National Team. The Nigerian National Team sponsor deal was “only” of ₦200 million. With this much budget Big Brother this year will be able to have better quality. The location will most likely be fancier than in previous years. Maybe they are even thinking about recording the show in South Africa. It will be very interesting to follow this development to see if more gambling operators are going to sponsor big events, teams and tv-shows like this to attract new customers. New from today is that even if you place your bet in on NariaBET shop you can withdrawal your money in any other NairaBET shop. Before it was only possible to make the withdrawal in the same shop as you made your bet. This is good news for players that often are on the move. For most players, this will not matter that much. The trend is clear, most new players are interested on playing online. If you want to play online check out our NairaBET review to get more information as well as a generous welcome bonus. There are 25 betting shops from NairaBET in Nigeria. These shops are spread out across the nation. In Anambra State, you can find one betting shop at 15, Onitsha Road Nnewi, Anambra. Lagos State has the most shops, with 11 shops. Most of them are in the city but you can also find shops at Somolu, Ebute-Metta, Yaba and Alapere. In Ogun State, there is one shop at Shop 132 Aroni Street, Sango-Otta Garage, Sango-Otta. Oyo State and Rivers State have 6 shops each. In Oyo State, all shops are in Ibadan and in Rivers State, all shops are in Port Harcourt. There are different legislation that forces gambling operators to have physical betting shops in order to have online betting. These rules are different in different countries. In the countries where it is not required the shops are slowly getting fewer customers and more and more people are moving into the online world. We expect this to also happen in Nigeria. It can take some years but eventually online casino and sports betting online will be much more popular. What we hear that people do not trust the technology and feel more secure to have a physical paper where the teams, odds and payout structure is presented. This is understandable but till most likely chance over the next decade when the online gambling operators have gained more trust in the market. Akwa United won over Yobe Desert Stars on the 6th of February with 1-0. With the win, Akwa United advances from the last position to the 7th position in Group B. It was a very important game even if the season just started. Yobe Desert Stars is now second from the bottom and have only 6 points after 5 played games. 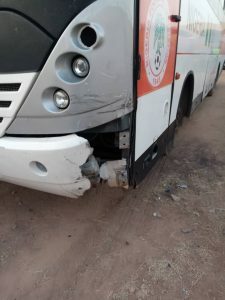 The fans of Yobe Desert Stars became very angry with the final score and ashamed themselves by attacking players in Akwa United by throwing stones at them as well as vandalising their bus. From what we have heard the fans of Yobe Deserts Stars started to throw stones at the players at Akwa United after the game finished. If this is true it is terrible. No one should ever have to be afraid of playing the game that they love. It must have been especially difficult for the players in Akwa United since this was an away game. 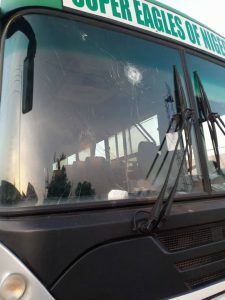 But it was not enough with attacking the players the fans also vandalised the bus of Akwa United. 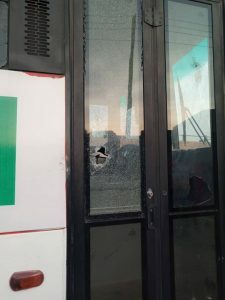 Here are some images from the vandalisation. It must have been a very terrible experience for everyone in Akwa United. The police had to use tear gas to push the angry fans back. It is still unclear what fine Yobe Desert Stars will get but it was not long ago since Plateau United and Niger Tornadoes got a fine of N1m each for troubling fans. This is definitely something to take very seriously. This is the players work and no one should have to feel insecure at a job. We hope and think that the organisations responsible for this will take actions. Let’s just hope the upcoming games for Akwa United vs Kada City and Yobe Stars vs Kano Pillars on Sunday the 10th of February will be a much more friendly event. It should be safe for both players, family, kids and women to watch football. If you want to play a bet on one of these games check out this top list of betting sites. Make the Nigerian National League safe again! Today John Junior Igbarumah signed a two-year contract with IK Sirius. IK Sirius is in the highest division in the Swedish league Allsvenskan. Last year John Junior Igbarumah scored 17 goals for the team Carlstad United. But today he will take the big step up to the highest division in Sweden. John Junior Igbarumah is trained in Dynamo Football Academy in Nigeria. That academy is a successful place for Nigerian players to start. Other starts such as Kennedy Igboananike and Moses Ogbu comes from the same Academy. Moses Ogbu is already playing in IK Sirius. Rumour says that he and John Junior Igbarumah knows each other quite well. The Sports Director of IK Sirius Ola Andersson says that they had their eyes on John Junior Igbarumah for quite some time. He was a great scorer last year and he will fit perfectly in the type of football we intend to play this year. John Junior Igbarumah has been great on practice and we have also played in a few games and it looks very promising. I and IK Sirius are very happy with this transfer. For the season of 2018 IK Sirius finished 4th from the bottom with 8 victories, 6 draws and 16 loses. This year the aim is much higher. It is only the third year in modern times that the team is in the highest league. Therefore, their accomplishment to stay in the highest league is very good. The first game for IK Sirius in 2019 will be on the 31st of March. It will be 30 rounds of games before the league is over. It will be very exciting to see what our two Nigerian players Moses Ogbu and John Junior Igbarumah will be able to do for their team. If you are interested in sports betting we recommend you to check out our page about it. You can learn everything from how odds work, different betting types and where you can play. If you have any questions about it do not hesitate to contact us and we will do our best to help you out.